What Should Happen to Mississippi's State Flag? In South Carolina, the debate over whether a Confederate battle flag should fly on its Capitol grounds is serving as a reckoning of its Southern pride with the more racist elements of its history. That debate is now spilling over into Mississippi, which faces a much larger potential identity crisis. In Mississippi—the state with the highest proportion of African-American residents—Confederate symbols are incorporated directly on the state flag, which flies in public view in front of courthouses, schools, and other civic institutions. According to the Mississippi code of laws, "The state flag shall receive all of the respect and ceremonious etiquette given the American flag." In the wake of the Charleston church shooting, state lawmakers in Mississippi are reconsidering whether these Confederate symbols should be held in such high regard. 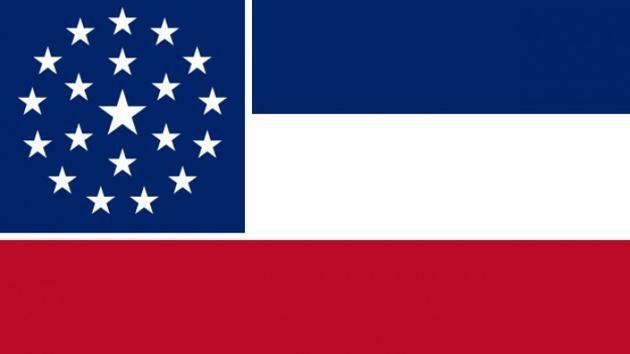 On Monday night, Philip Gunn, Mississippi's Republican speaker of the House, called for a new flag. "As a Christian, I believe our state's flag has become a point of offense that needs to be removed," Gunn said in a statement. "We need to begin having conversations about changing Mississippi's flag." The results were clear: 64 percent chose to keep the design that still flies. "The state is two-thirds white and one-third black, just like the vote split on the flag," a 2001 Los Angeles Times account of the vote noted. Mississippi Gov. Phil Bryant, a Republican, is inclined to let the results of that referendum stand. According to the Clarion-Ledger, a Jackson, Mississippi daily, Bryant said "he didn't expect the Legislature to 'supersede the will of the people on this issue.'" But others say times have changed. "That was 14 years ago," Mississippi state Rep. Earle Banks, a Democrat, told CNN Tuesday about the voter referendum. "You have a whole new generation of young people coming in, and I believe the margin to keep the flag lowered is much more than it was." Mississippi's senators distanced themselves from questions about the state flag Tuesday. "I feel that it's up to the legislature," Sen. Thad Cochran told reporters. "I support the will of the people of Mississippi, as well as the rights of other states to make their own determination on this issue," Sen. Roger Wicker said in a statement. The 2001 effort to replace the flag was led by the Mississippi Economic Council, an association representing state businesses. The council argued the Confederate symbol has hurt the state's economy, scaring away companies that might want to move to Mississippi. "We still hold that position," said Blake Wilson, the association's president and CEO. "There's no question about it: This is an offensive symbol to a large part of our population." After the referendum loss in 2001, Wilson commissioned a polling firm to ask 300 voters if they thought the flag would could ever be amended; 48.3 percent said, "Yes." It wasn't a majority, and it wasn't even half of those polled. But that 48 percent figure represented a larger portion of voters than those who favored change on Election Day. "It's been 14 years," Wilson said, when asked if he thinks the result of the referendum would be different if held today. "A lot has happened in Mississippi."